Putting consists of two parts. Learning to putt straight and learning to putt a specific distance. You need both skills to get better at putting. A is the mechanical side of the equation, and B is the part to do with judgement and feel. One part is more robotic, the other is more touch. To putt well, you must first learn how to putt straight. In other words, before you learn how to control distance and read lines, you must be able to send a ball off on a straight path consistently. In this respect your stroke must repeat in such a way that your putterface is always square to your target at impact. How to putt straight is the first part of the challenge of putting. Unfortunately it is a part that most golfers seldom master. Much of the problem has to do with poor fundamentals compounded by an ill-fitting putter. For example, a compromised setup hinders rather than helps your putting stroke. That said golfers can still achieve with practice a reasonable success rate even with faulty mechanics. 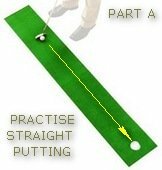 Usually this results in episodes of streaky putting as they do not get good feedback when practising to judge how straight they are striking their putts. Practice putting greens are like greens out on the course. They need to drain off the surface water and therefore for most putts there is some break. Unless you are putting straight up or down the fall line, your putt will move either left or right. To learn how to putt straight you need an indoor work station where the surface is completely level. There are training aids to help you in the form of a flat rail that will highlight an errant putt. Dave Pelz has likened putting on the average practice green in terms of learning about your stroke as useful as putting on a gravel parking lot. When you can consistently send your ball off in a straight line, you are ready to graduate to the second challenge of putting. In Part A of the Putting Equation you learn how to putt straight without regard to how far you hit the ball. That is not part of the task. Now in Part B it is an essential component that must be blended with reading how your ball will break. The read of how your ball will travel across the surface of the green of a sloping green is a marriage between the speed the ball is travelling and the direction you start it on. As you already know how to hit a straight putt, it is now a matter of choosing a starting line and then applying the correct force to your ball to get it to the hole. In this respect Part B is more judgement and feel than Part A which is just a matter of doing the same thing over and over. Your initial practice in Part B should be aimed at learning how to hit your ball a specific distance. Once you can do this consistently, you are in a better position to pick your line to match the anticipated speed of the ball. The Putting Equation consists of two parts A and B. A is not dependent on B, but the success of B in holing putts on sloping greens is ultimately dependent on A. This should help you to set a framework for your putting practice.